Someone from Spring Hill, FL signed. is congress afraid to hear the whole truth? Michael V. from Philadelphia, PA signed. Clifford F. from Las Vegas, NV signed. Jim H. from Austin, TX signed. Donna B. from Raleigh, NC signed. Donna L. from Tallahassee, FL signed. Someone from Bonham, TX signed. Kathryn M. from Woodstock, GA signed. David and Darleene K. from Gilbert, AZ signed. Lenaer N. from Crossville, TN signed. Hans R. from Alpine, CA signed. 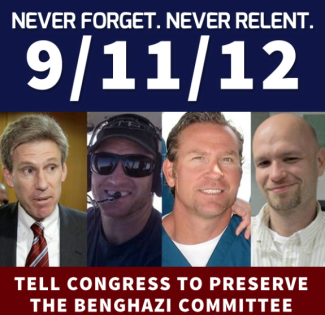 These 4 brave Americans deserve justice be served to Hillary and Obama, and the others who allowed this event to happen!!! Douglas T. from Framingham, MA signed. Ellen B. from Agoura Hills, CA signed. Please give them justice they deserve! And the people behind hiding the truth brought to justice! Will C. from Kingston, NY signed. Lyle P. from Cape Coral, FL signed. what else is being done in washington? you all need something to do. go after the liar hilliary! Until we find the truth about what really happen, how and why. Efforts to dissolve the select committee on Benghazi with senator Trey Gowdy should be stopped. Revelation's exposed by the committee and Judicial Watch clearly show criminal activity. Charges of corruption, interfering with justice and no doubt others are in order. A. Jane L. from Reno, NV signed. Kathy H. from Martinez, CA signed. Never give up until the truth comes out. Was the ambassador there to run guns? Someone from Lynden, WA signed. Ronald S. from Bowling Green, OH signed. James S. from Crystal Falls, MI signed. Ray and Linda M. from Burlingame, CA signed. Boyd T. from Columbia, TN signed. This situation should not be taken likely! Sigurd E. from Weed, CA signed. Sandra T. from Mesquite, TX signed. Walter B. from Endicott, NY signed. Steven J. from Sellersburg, IN signed. Kari S. from Houston, TX signed.